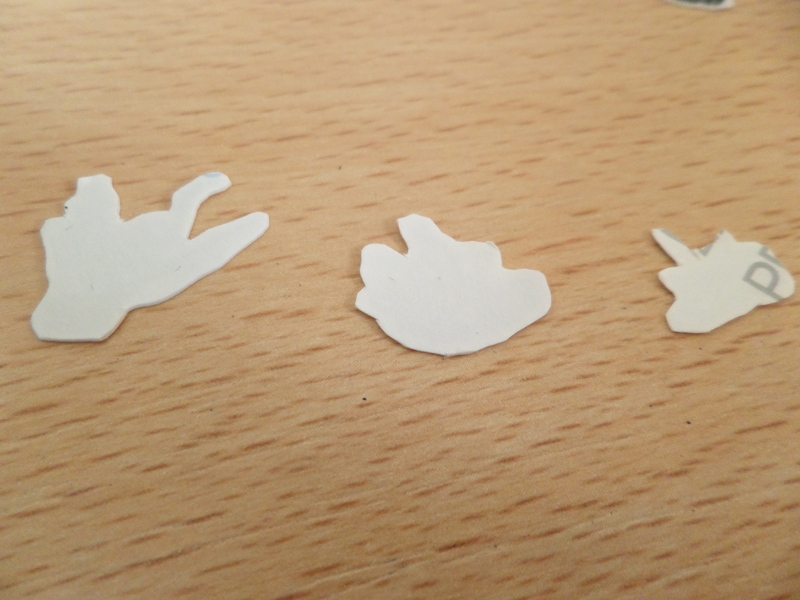 After some tribulation with trying to find a laser printer which I could load my own paper into, I managed to get my flies printed onto my ceramic decal paper. 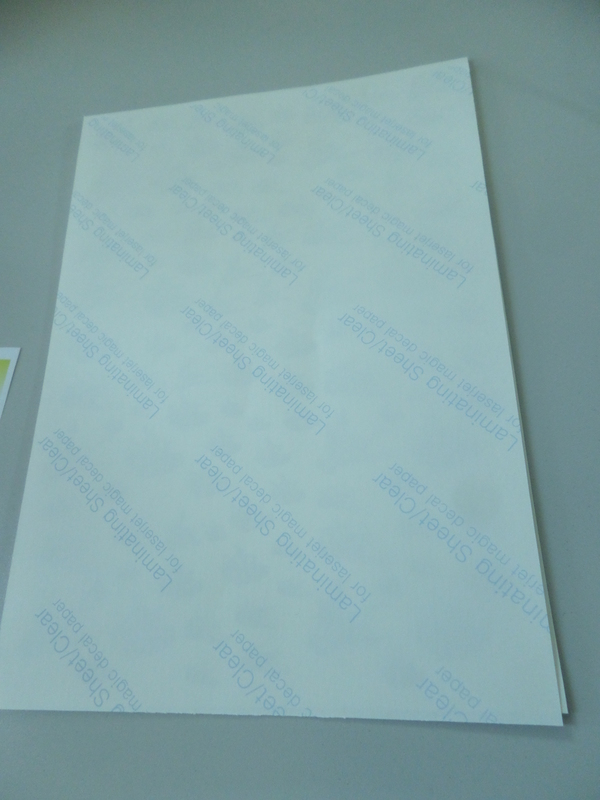 I figured seeing as I only had one sheet, and I couldn’t print onto it more than once I may as well completely fill it, and this also leaves me with the option of making plenty of dead fly tableware in future. 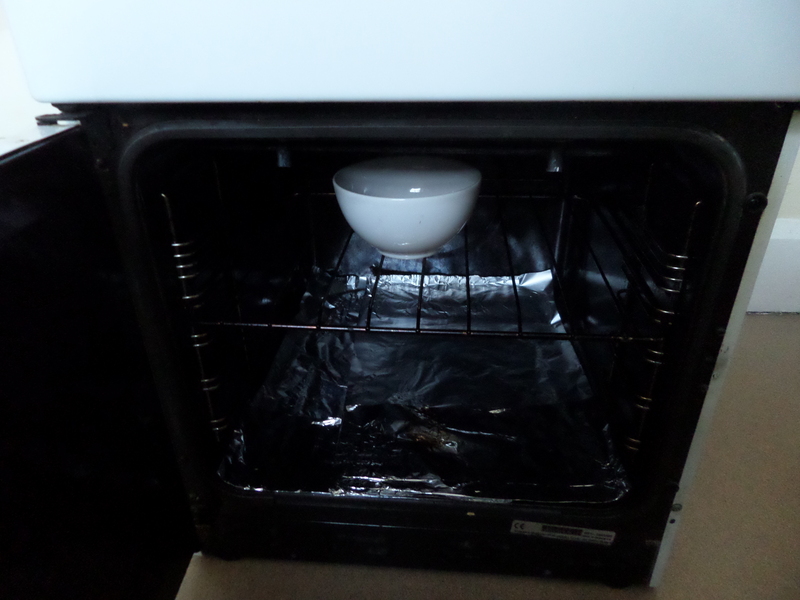 First, the instructions said to turn the image so that it is “right reading”. I can only assume that this means opposite to the way it was printed? And then wet that side with a damp sponge. 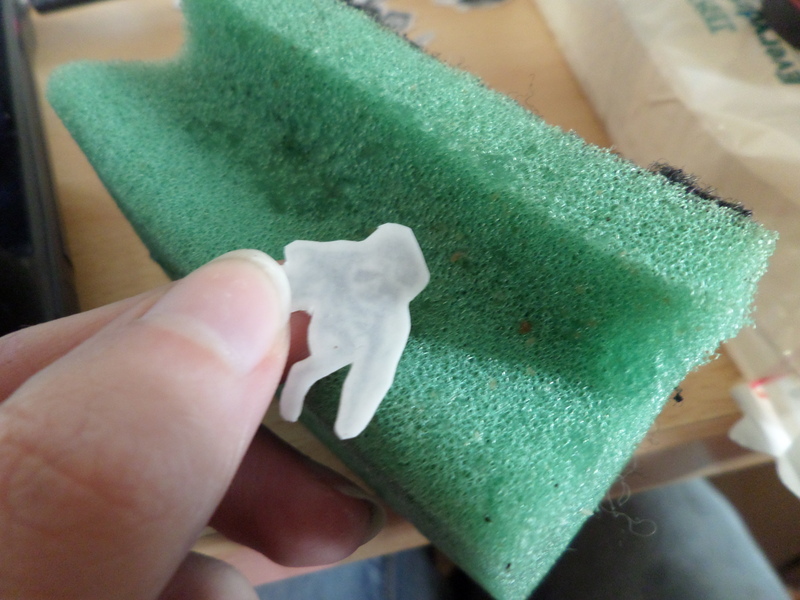 After 30 seconds, slide off the white paper on the top layer. 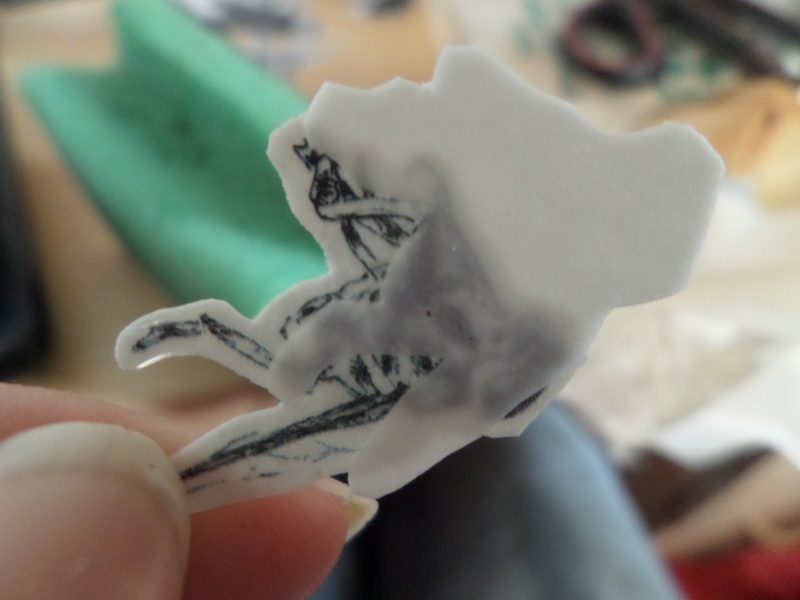 Then submerge the decal in water until soaked, and remove, then placing face down (revealed side down) onto your surface. 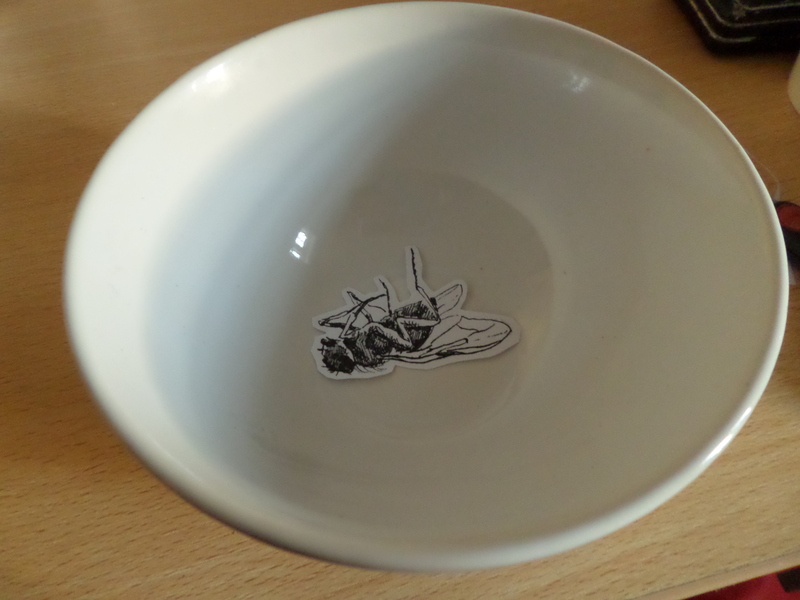 Before printing out onto my special ceramic decal paper, I wanted to first test out how various sized version of the flies looked, both in terms of quality and in the context of the bowl itself. I think that the medium-small sized flies are the most effective, with the largest flies being to big and the smallest being too small. The flies which are closest to the real size of flies, if not slightly larger are the most off putting, with the potential to mistake them for real flies. 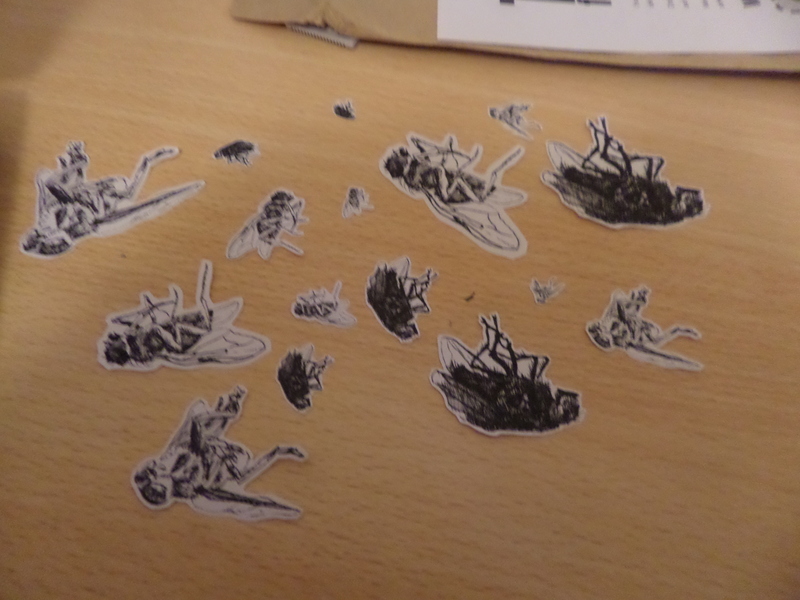 While I very much like having a small amount of flies in the bottom of a bowl, when cutting them out I found there is also something very pleasing about having many flies of all different sizes laid out in a pattern. I think that this could be used as a very successful design in all sorts of areas, on cushions, bags, plates, notepads, etc. This might be something I will look into in future. 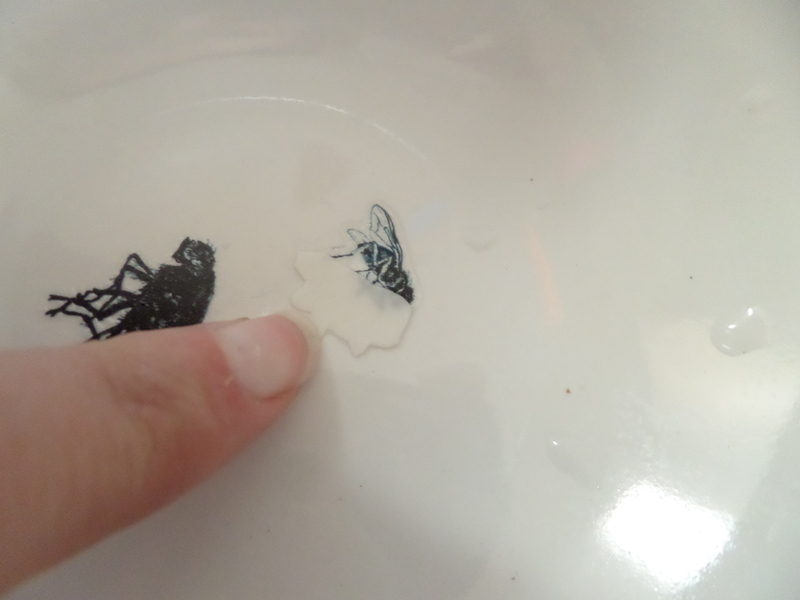 After my week in France at La Perdrix and our collaborative project in making dinnerware, and I was specifically painting dead flies into bowls, I realised that I could use this as a basis to bring forward my internet of things project which I had previously been pretty stuck for ideas on. The project in France originally planned to have an outcome involving Augmented Reality, although we didn’t manage to achieve that due to the very poor internet making us unable to be able to upload videos to Aurasma (an augmented reality program). 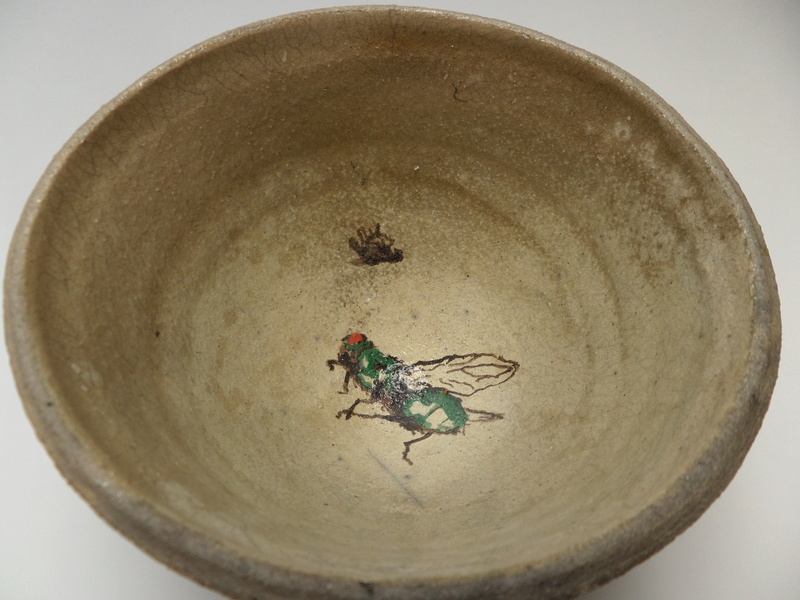 However I thought that this was something I would be able to relate back to the Internet of Things, which was a bonus because I had been very much enjoying painting flies in bowls and wanted to continue. 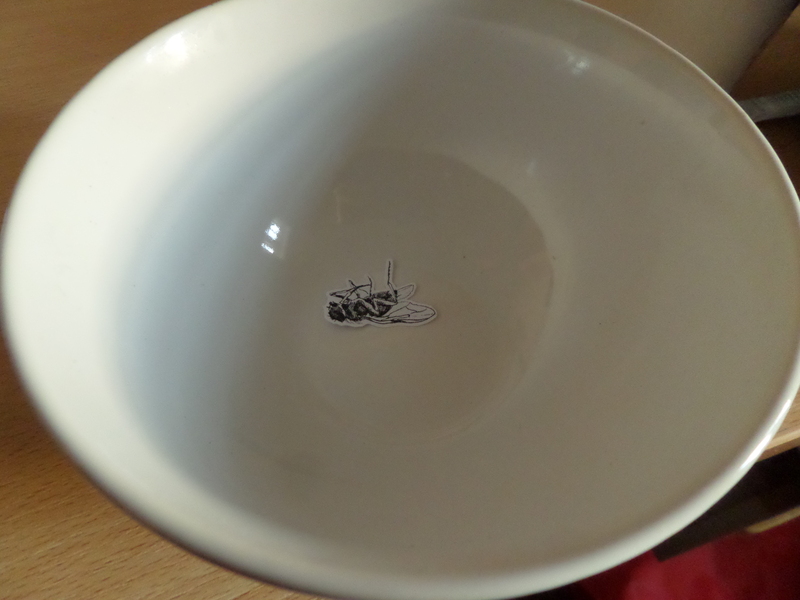 Ideally I would like to be able to throw my own bowls and to paint the flies in with glaze, as I did in France (although I can’t take any credit for having thrown the bowls, they were all made by a ceramics student Jago Poynter in my group). However, with my very limited experience of throwing, the last time I did so being a year ago on my previous trip to La Perdrix I do not feel confident enough to be able to produce pieces of good standard in the amount of time we have left in university, especially given that time and resources are becoming increasingly more scarce towards the deadlines. 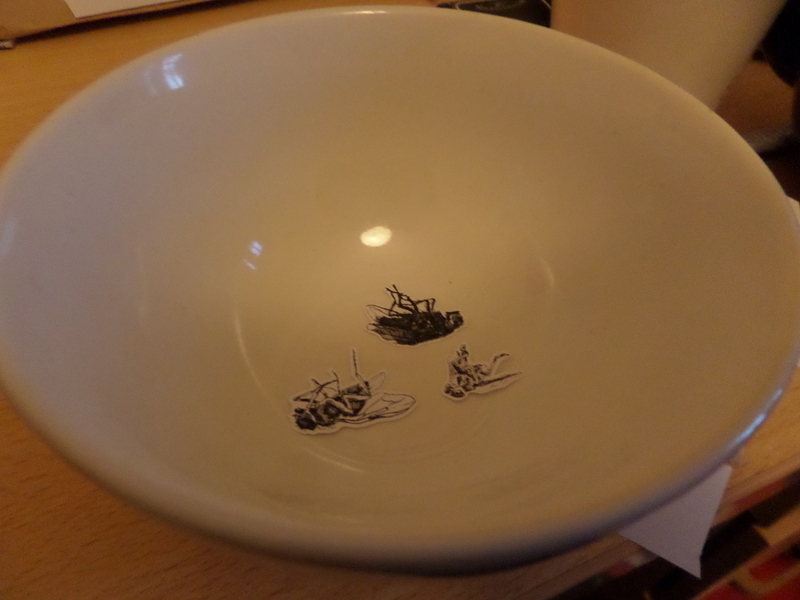 But, after having spoken to my tutor Ingrid Murphy about this it was suggested that I could use ceramic decals, which would allow me to print an image onto the decal and then transfer it onto an already glazed bowl. 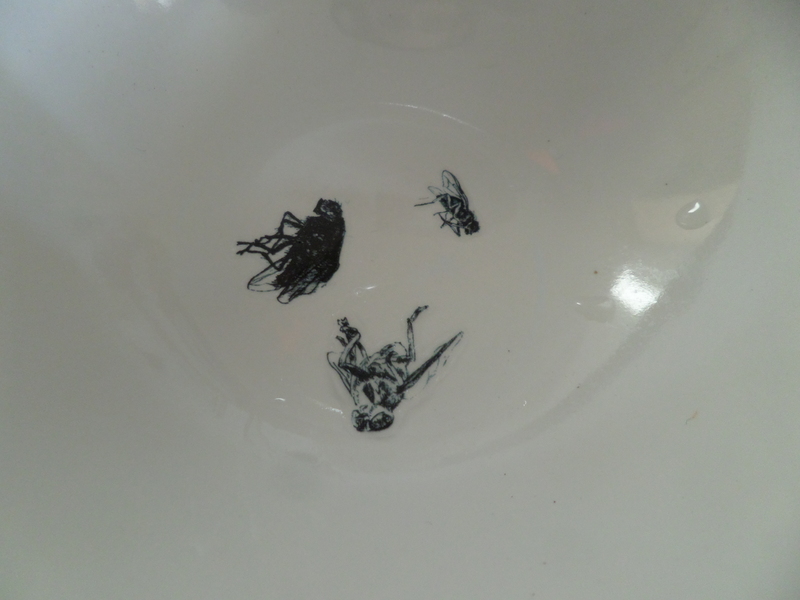 This means that I can buy some bowls that suit my purposes, and then transfer drawings of flies and insects I have done onto the surface in order to get the effect I want. 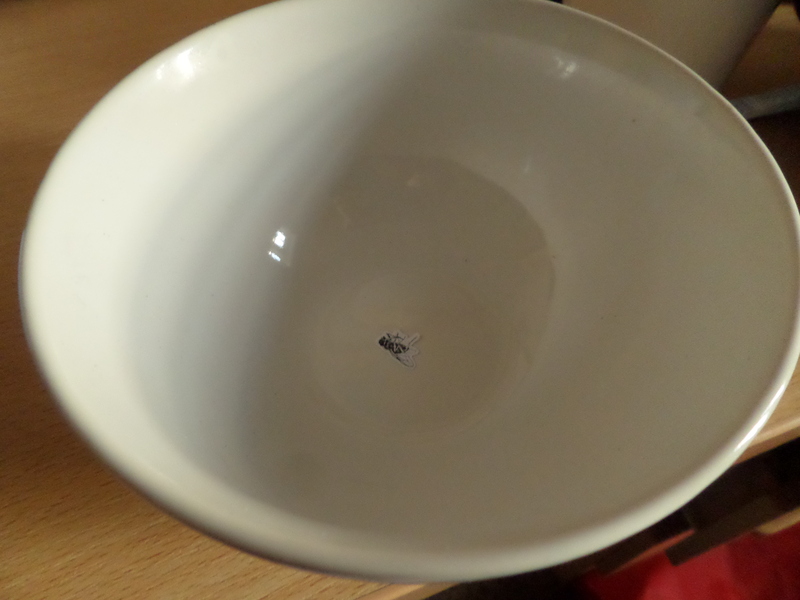 I then intend to link this to Aurasma, which will then overlay a video, perhaps of the bowl full of soup and then draining to find the fly at the bottom, or having real dead flies floating in the soup. I like the idea of creating a piece of work with a humorous tone to it, which is not only functional but desirable because of it’s novelty (as well as hopefully skill with the illustrations). I think the augmented reality will then be able to enhance this novel and humorous element, reinforcing the joke of the disgusting idea of finding an insect at the bottom of your soup but in a safe environment where you can recognise it is not going to do you any harm.